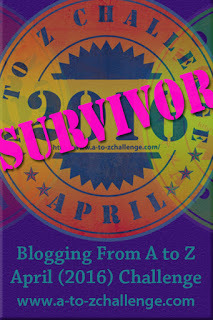 For the fourth consecutive year I’ve entered my blog into the annual A-Z blogging challenge. From the 1st April to the end of the month, I shall blog each day (except Sundays) using each letter of the alphabet to represent my posts. Themes aren’t compulsory, but I like to use them to help focus my content. In previous years, I’ve done Castles, Cathedrals and Monasteries and Great Houses (see menu bar). This year the history aspect continues and I’m using nature as my foundation rather than stone. People still feature heavily as this is about history and places, but so will other living things. So here it is, my 2019 theme is…. The History of Great Gardens from trees to flowers, water features and landscaping, the designers and patrons. Gardens, a living memory of our past! I hope you’ll join me! Looking forward to reading posts from other blogs too. That’s a great theme, wondering if you are presenting gardens from all over the world or one part…all the best for the challenge. Just gardens in Britain, but with references to other countries where appropriate. Gardening is very international! Hope you’ll stop by for the first post. Oh yes, really looking forward to this! That’s another great theme. I always love your challenges. Can’t wait to read this new one! This should be a fun theme! I love gardens. Interesting theme – you got me curious! I look forward to seeing the gardens you are going to share with us. WOW! History of Gardens. Love it, already. Looking forward to reading your blogs in April. Wish you the best with A2Z challenge this year. Sounds like an interesting theme. Came to your blog via the Theme Reveal list on a to z challenge blog.